Our scripture readings this Sunday instruct us on the importance of receiving the Lord, and those who speak on the Lord's behalf, with hospitality and reverence. And the reward is great for those who do so. Our first reading from the Second Book of Kings (4:8-11, 14-17) is a story about a Shunemmite woman who recognizes the prophet Elisha as a "man of God" and provides a space for him to stay in her house when he passes through her town. And he rewards her with a son in her old age. One day Elisha came to Shunem, where there was a woman of influence, who urged him to dine with her. Afterward, whenever he passed by, he used to stop there to dine. So she said to her husband, "I know that Elisha is a holy man of God. Since he visits us often, let us arrange a little room on the roof and furnish it for him with a bed, table, chair, and lamp, so that when he comes to us he can stay there." Sometime later Elisha arrived and stayed in the room overnight. Later Elisha asked, "Can something be done for her?" His servant Gehazi answered, "Yes! She has no son, and her husband is getting on in years." Elisha said, "Call her." When the woman had been called and stood at the door, Elisha promised, "This time next year you will be fondling a baby son." In our Gospel reading (Matthew 10:37-42), Jesus continues the preparation of his apostles for their commissioning to go out to "the lost sheep of Israel". In this section, Jesus instructs them on the conditions of discipleship and then, what those who receive them ought to expect as their reward from God. Anyone who receives even the "littlest disciple" receives Jesus, and the Father. Jesus said to his apostles: "Whoever loves father or mother more than me is not worthy of me, and whoever loves son or daughter more than me is not worthy of me; and whoever does not take up his cross and follow after me is not worthy of me. Whoever finds his life will lose it, and whoever loses his life for my sake will find it. "Whoever receives you receives me, and whoever receives me receives the one who sent me. Whoever receives a prophet because he is a prophet will receive a prophet's reward, and whoever receives a righteous man because he is a righteous man will receive a righteous man's reward. And whoever gives only a cup of cold water to one of these little ones to drink because the little one is a disciple- amen, I say to you, he will surely not lose his reward." In our Epistle reading (Romans 6:3-4, 9-11), St. Paul teaches us the true meaning of our Baptism. Knowing this, we are called to live accordingly. Brothers and sisters: Are you unaware that we who were baptized into Christ Jesus were baptized into his death? We were indeed buried with him through baptism into death, so that, just as Christ was raised from the dead by the glory of the Father, we too might live in newness of life. If, then, we have died with Christ, we believe that we shall also live with him. We know that Christ, raised from the dead, dies no more; death no longer has power over him. As to his death, he died to sin once and for all; as to his life, he lives for God. Consequently, you too must think of yourselves as dead to sin and living for God in Christ Jesus. Our stories about hospitality for the prophets and the righteous can be seen in two ways. First, the physical reception of kindness and hospitality, which is important and necessary. But secondly, in the spiritual sense, we must be willing to receive the word of God in our hearts with reverence and genuine love. 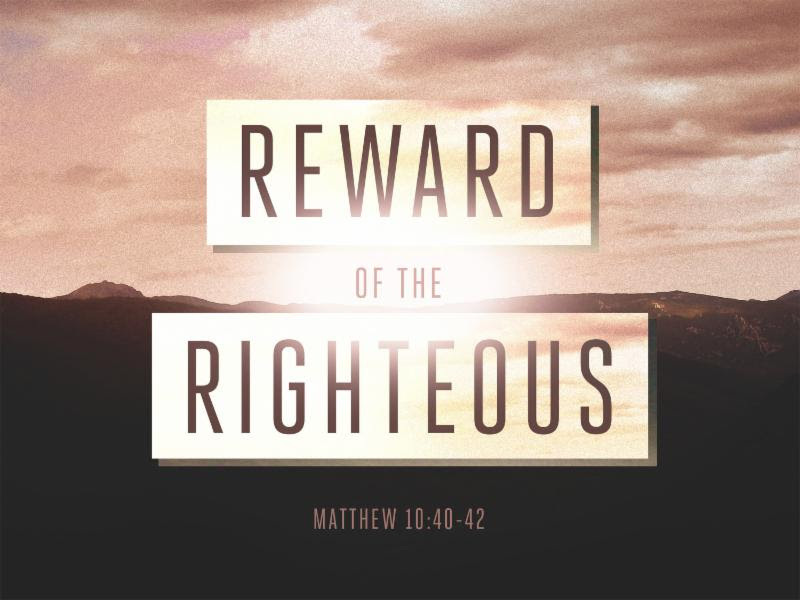 Jesus assures us, our reward will be great.